William F Buckley National Review and G. Edward’s Hillsdale College crush conservatives stealthy and openly as New World Order is threatened. When I first started writing for National Review in 2015, Nick Frankovich was my editor. He always was kind and professional, offering advice on how I could develop my nascent writing style. Although we never met in person, he appeared to be cautious and reserved. 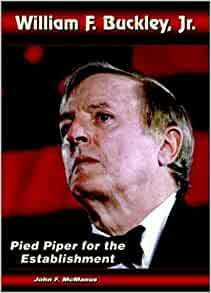 I know he is a man of deep faith and very devoted to the magazine William F. Buckley, Jr. founded in 1955. So it seemed way out of character for Frankovich to author an angry post about the Covington Catholic High School incidentjust as the details were emerging. His article—”The Covington Students Might As Well Have Just Spit on the Cross”—went online in the middle of the night on National Review’s portal for short posts by contributors. Frankovich harshly condemned the students, referred to their actions as evil and sadistic, and questioned their Christianity. “They mock a serious, frail-looking older man and gloat in their momentary role as Roman soldiers to his Christ. Bullying is a worn-out word and doesn’t convey the full extent of the evil on display here,” the deputy online editor wrote. He included accusations that had not yet been confirmed. On Sunday afternoon, as the media’s narrative fell apart and the reality of the situation came into view, National Reviewquietly removed Frankovich’sarticle from its website. Rich Lowry, the outlet’s editor, explained in a very brief post that he and Frankovich had been duped by a “hoax” and that Frankovich’s “strongly worded post” had been taken down. Lowry also deleted a few of his own tweets that inaccurately portrayed the incident. That was it. Rather than acknowledge that the editor and deputy editor for a once reliable and thoughtful conservative magazine were complicit in mob-shaming teenage boys attending a pro-life rally, they quickly excused their behavior as nothing more than gullibility. There was no apology, save for this quasi mea culpa. There was no “calling out” other conservatives who also had participated in the viral assault on innocent young boys. Two NRO articles addressed the the media’s malfeasance in the matter. In particular, “Nathan Phillips Lied, The Media Bought It,” wrote Kyle Smith. So, what motivated a seemingly measured man like Frankovich to pen a midnight hit piece on teenagers? What compelled Lowry and Nordlinger to join the outrage mob, and Goldberg to defend their choice? Why do NeverTrump (or even SometimesTrump) “conservatives” like Lowry more often than not side with the Left’s mercenaries in the media who are hellbent on destroying this presidency and the people who support it? After all, these are the same folks who warn us on a daily basis that the president cannot be trusted, that he’s a dishonest purveyor of the truth, and that his cult-like followers have no ability to distinguish fact from fiction. In an interview Monday night, Goldberg again defended his side’s confirmation bias by invoking another tactic—false equivalence. “The confirmation bias that says, ah ha, this proves that the people I disagree with aren’t just wrong, they’re evil, which is rampant on both sides of the aisle these days.” Contrary to how Goldberg tries to sell it, it’s pernicious on one side: His. But this time they crossed a line. It wasn’t their usual hyperventilating about Trump-Russia conspiracies or “shithole countries” comments or exit strategies for our troops in the Middle East. No, this time they exploited innocent high school students for their own political gratification. They abandoned not just their professional duty but their self-proclaimed conservative principles and any sense of decency—all in order to Get Trump. It’s hard to see how they can stoop any lower. And these weren’t just any group of random high schoolers. These are boys who were attending an event to support a cause that conservatives have championed—despite immense cultural opposition—for the past four decades. Young boys who attend a religious school and presumably are from faithful families trying to instill traditional values in their children despite the Left’s continued assault on those values. Young boys who probably represent everything that the modern-day conservative movement has claimed to promote since its inception. Young boys who probably view their MAGA hats as a sign of patriotism and respect for the president, not a symbol of Racist Rube Nation. Young boys who we now know acted in a polite and deferential manner even while they were under attack by grown men taunting them and hurling hateful epithets at them. But what did Trump-hating “conservatives” do? They betrayed boys who, by all appearances, are the progeny of conservatism. They aided the Left in the virtual thrashing that prompted death threats against the children and their families. They acted in the same way—worse!—they accuse the president of behaving. They sided with the enemy. And when confronted with evidence, there is no real apology or soul-searching. The public and the maligned families are just supposed to accept their vague, “oops, my bad” tweets and move on. Further, the same crowd of call-out conservatives, the nags who constantly are telling us which Republican lawmaker or presidential aide or Fox News anchor must be reprimanded for one imagined offense or another, have been silent on calling out their own tribe for joining the Covington High School outrage mob. Where is David French “calling out” his pal, Bill Kristol, for his two (deleted) tweets about the kids, including calling them “MAGA brats”? Where are the Referees of the Right demanding that Ana Navarro or Ben Howe or Jennifer Rubin apologize for vilifying innocent kids? Where are the conspiracy trackers like Jim Swift condemning Jim Swift for peddling this fiction? In 2011, Sarah Elizabeth Cupp was hired as a writer and commentator for Mercury Radio Arts the organization owned and operated by Counterfeit Conservative Glenn Beck . Shortly after being hired by Beck, Cupp was given her own show.